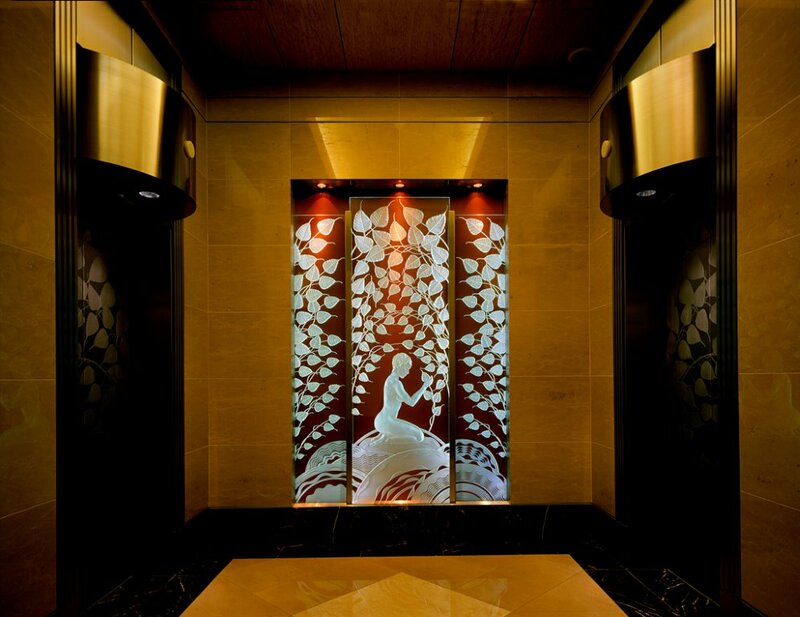 Designed for the lobby of a magnificent Neo-Deco skyscraper, this pair of 9 ft x 6 ft crystal triptychs with their matching etched steel elevator doors strikingly welcomes visitors to the UPPER floors with the upward Rising Birds (above), and to the LOWER floors with the Garden Bower theme (pictured below). The figures and birds are deep-carved by hand into the backs of inch-thick slabs of crystal. Custom steel framing houses hidden state-of-the-art LED edge-lighting, which casts breathtaking reflections on the lobby floor, the opening and closing elevator doors and the walls. These images are designed in the tradition of Rene Lalique's superb glass and crystal mascot figures and of the American modernist sculptors who used heroic and allegorical figures in their building ornamentation. They strike a beautiful and symbolic balance to the strong masculine-structured engineering of this eye-catching 26-story landmark.